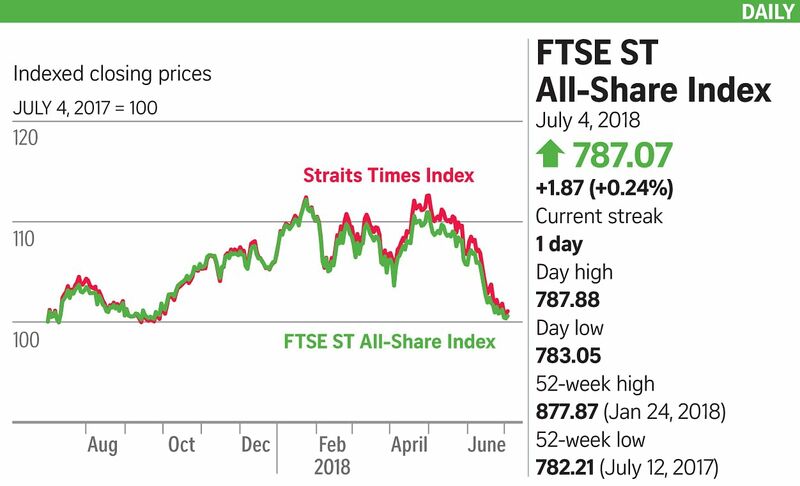 Bucking the falling trend across key Asian markets, the Straits Times Index (STI) rose 0.28 per cent to close at 3,244.89 yesterday, the first time it has risen since the first trading day of this month. Turnover here was 1.98 billion units worth $1.01 billion, with losers edging out gainers by 188 to 177. Icy trade relations between the United States and China kept bourses depressed across the region with tomorrow's tariffs casting a pall over equity markets. The Nikkei 225, Hang Seng, Shanghai Composite and Kospi ended lower as they felt the heat from trade tensions. In a note, DBS Equity Research expects the STI to head to a low of 3,200 before rebounding to 3,355 or even 3,417. One of the reasons it gave for the rise was the upcoming second-quarter 2018 earnings season, which will be a distraction from the trade-war noise. Singtel shares shrugged off its Web outage yesterday, adding five cents, or 1.66 per cent, to close at $3.07, putting it among the mainboard's top 20 gainers. Transport operator ComfortDelGro advanced seven cents, or 3.04 per cent, to close at $2.37, continuing an upward trend. A potential increase in its taxi fleet, coupled with projected profit growth in fiscal 2019, moved DBS Group Research to upgrade ComfortDelGro from "hold" to "buy" with a target price of $2.59, a 13 per cent upside from its previous target. Speaking at the Monetary Authority of Singapore's annual report media briefing, managing director Ravi Menon said Singapore's economic growth will remain steady despite rising trade friction. Overall gross domestic product is expected to expand at 2.5 to 3.5 per cent this year, unchanged from an earlier May official forecast. Mr Menon cautioned that while the central prognosis for the Singapore economy this year remains intact, "spillovers from global trade conflicts bear close watching". Shares in the big three banks - DBS Group Holdings, OCBC Bank and United Overseas Bank - took note of the positive sentiment, all closing higher. The semiconductor industry remains at the heart of the global trade dispute, with a Chinese court announcing a temporary ban on chip sales by the US' Micron Technology. Singapore semiconductor shares closed mixed after the announcement, with UMS Holdings ending 1.24 per cent lower at 79.5 cents, while Ellipsiz closed flat at 47.5 cents.